Holiday Happenings at Red Cup Espresso! Spread some holiday cheer with Red Cup Espresso! 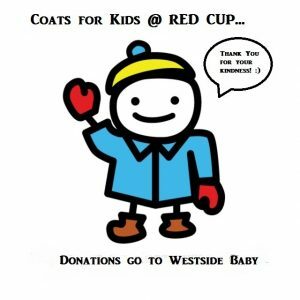 Coats for Kids @ Red Cup is still happening! Bring in your new or gently used winter coats and all donations will go to WestSide Baby in White Center. Did you know that on Fridays, Red Cup has a delicious assortment of vegan pastries? And that they are looking to expand possible in shop savory options (details to come).